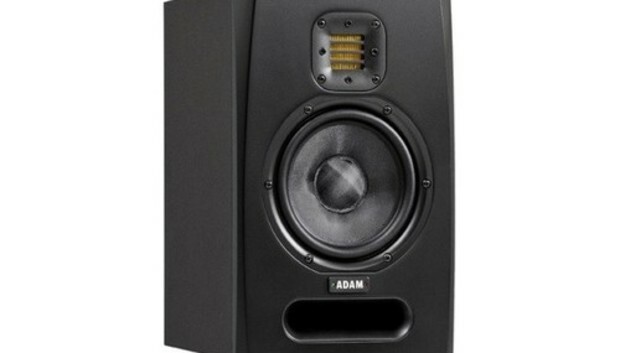 Adam Audio's F5 Active Nearfield Monitor is the smallest member of the company's F-Series family, which caters to the entry-level pro audio market. Advertised as near-field monitors and priced at $250 per speaker, two F5s make impressive companions on a largish desktop or mounted on a nearby wall. Each black F5 sports Adam's X-ART tweeter and a 5-inch, glass-fibre/paper woofer. Separate 25-Watt amplifiers power each driver. Unlike traditional "computer" speakers, the F5 is not shielded, though in a day when CRT monitors are extremely rare, this is unlikely to be an issue. The power supply is switchable between 115 and 220 volts. The back of each speaker includes two inputs: one pair of RCA jacks and an XLR/TRS jack. (The RCA input overrides the XLR/TRS if you've made connections to both.) Also on the back are three control knobs: one for volume and the others for controlling the level of high-shelf (above 5 kHZ) and low-shelf (below 400 HZ) frequency ranges, with each of these adjustable to ±6 dB. You'll also find a Highpass Filter switch that offers Flat and 80 Hz options. You'd use the latter position when pairing the speakers with Adam's SubF subwoofer--when set to 80 Hz, the F5 stops delivering frequencies below 80 Hz, leaving that job to the subwoofer. At 11.5 inches high, 7.5 inches wide, and 9 inches deep, and weighing 15 pounds each, a pair of these monitors will dominate a small desktop. But if you care deeply about the sound of your music, you might consider buying a larger desk--the F5's audio is that good. Unlike some bookshelf or larger computer speakers that try to serve many purposes, the F5 is at its very best as a near-field monitor. For those unfamiliar with the term "near-field," it generally refers to listening from a few feet (or less) away, such as at a desk or studio console; the "monitor" label usually means a set of speakers is designed for the monitoring of recordings, so they aim to provide a reasonably uncolored tone, where no frequencies are particularly favored over others. I've had a pair of F5s on my desk for the past month, and I've grown to love them. All my music is there--the bass is nicely defined without feeling jacked up, the midrange is present but not muddy, and the high end is clear without shrillness. When the speakers are properly placed, the stereo field is nicely expansive. In addition to using them for music playback from my Sonos gear and my Mac Pro, I've used the F5 pair to master some podcast themes I've recently created. The speakers beautifully handled the low string parts, the equally low orchestral percussion, and the bright pads and synths I threw at them. Having originally recorded those parts with headphones, I was surprised at how much more I could bring out of the music when listening with a pair of F5s--particularly in terms of pulling some of the parts out of the midrange muck. It may seem like a lot to spend $500 for a pair of speakers that you place on your desk. And if all you want from those speakers is to hear the occasional system alert and listen to the sound accompanying YouTube videos, perhaps it is--an F5 system really isn't for you. But $500 for a great pair of compact near-field monitors is hardly an extravagance for those who take their music (and music making) seriously.